In 1953 the enormous XH-16 turboshaft tactical transport helicopter, the Transporter, was built. It had tandem three-blade rotors, a very capacious fuselage, equal in size to that of a four-engine DC-4 transport aircraft, and two engines, one at the front and the other in the rear of the fuselage. The rear engine drove the rotor at the top of a tail pylon nearly 4m high. The helicopter had a horizontal stabilizer, to which vertical control surfaces were later added in order to overcome problems of directional stability during fast flight. It weighed 14 tonnes on take-off with two pilots and 40 equipped infantry on board. The XH-16 was evaluated at length by the US Army for troop transport and the second prototype introduced two 1800shp turbine engines, when it first flew in 1955. Designated the YH-16A, this aircraft set an unofficial world record of 270km/h. A flying crane version was also studied, but the project was abandoned as suitable turbine engines were not available. 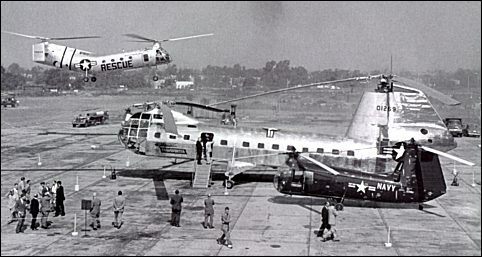 Eighteen months after the H-21, the Piasecki YH-16 Transporter � the other new tandem machine ordered by the Air Force � took to the air at Philadelphia International Airport. On October 23, 1953, company personnel and military officials watched the majestic helicopter take off, hover, and fly forward and sideways during a successful twelve-minute maiden hop flown by Harold Peterson and Phil Camerano. "It was just like watching an ocean liner pick up and fly," recalled Ken Meenen. The Transporter was by far the largest helicopter then flown. It was 23.8m long and topped by two overlapping rotors each 25m in diameter. In-flight vibration was low and of a loping nature. Bonded and tapered all-metal rotor blades (built using a new company process) combined milled-aluminum skins, aluminum honeycomb filler, and a leading-edge balance weight that also served as a mechanical fastener for the skins. A USAF requirement for a wide-ranging helicopter capable of rescuing downed strategic bomber crews had given rise to the new helicopter. The hefty fuel capacity required to meet its specified 2250km range in part dictated its size. Without the extra fuel, the capacious aircraft also had possible military application as a large troop and cargo transport. With this alternate use in mind, the company announced that the Transporter could carry forty passengers or three light trucks loaded through its rear ramp. These capabilities appealed to the U.S. Army, which saw in the H-16 an answer to several helicopter mission requirements of its own. It therefore joined the USAF in sponsoring further development of the YH-16 (the "Y" prefix denoted reclassification from experimental to service-test status). The helicopter's utility was limited, however, because it was underpowered despite two 1650hp Pratt & Whitney r-2180 radial engines. 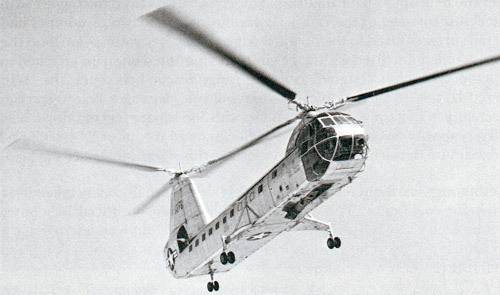 Like the Dogship before it, the YH-16 lifted as much as it did only because of very low disc loading that compromised other aspects of its performance. Greater power was clearly needed to realize the design's potential. Turbine power provided the answer. Smaller, lighter, more powerful, and more reliable than piston power, turboshaft engines then promised to revolutionize the entire helicopter industry. Two 1800shp Allison T38 units were accordingly adapted to the Piasecki design to create the world's first twin-turbine helicopter. Designated YH-16A, this second aircraft took to the air in July 1955 with Harold Peterson and George Callaghan at the controls. When it set an unofficial speed record of 267km/h the following year, prospects for the H-16 program could not have looked brighter. 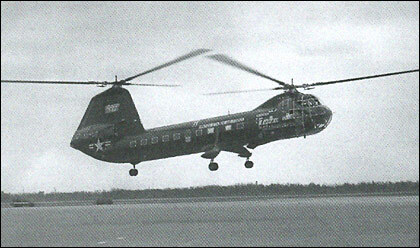 Piasecki had met a challenge others had thought impossible (Sikorsky had declined to bid for this same USAF contract). In the process, the company had once again extended the technological boundaries of rotary-wing flight. In December, the YH-16A broke apart in the air and crashed near the Delaware River, killing Peterson and Callaghan as they returned from a test flight in New Jersey. Investigators determined that the rear rotor shaft had failed, allowing the blades to desynchronize and wobble into the plane of those of the forward rotor. In fact, a frozen bearing in the test instrumentation had precipitated this failure by allowing a steel-tube standpipe, placed within the aluminum rotor shaft to guide wires from the instrumented blades, to undetectably inscribe a deepening groove within the shaft. This tragic accident caused the H-16 program to be scrapped, preempting the sixty-nine-passenger YH-16B Turbotransporter (a conversion of the YH-16 then in progress), which would have flown with two 3700shp Allison T56 engines. It also preempted Frank Piasecki's vision of interchangeable under-body pods for the rapid transport of differing loads such as field operating rooms, communications centers, and mobile repair centers. 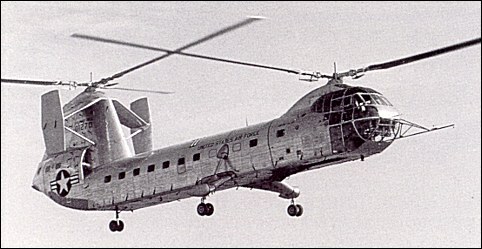 A tall stilt landing gear had already been designed to let the YH-16B accommodate such pods. In 1946 the Army Air Forces awarded Piasecki Aircraft a contract for the development of a tandem rotor helicopter intended for use in the long-range search and rescue (SAR) role. The resultant Piasecki Model PV-15 was originally given the military designation XR-16 (R denoting rotorcraft under the World War II system), though this was changed to XH-16 in June 1948. The Air Force placed an order for two service test and evaluation aircraft in June 1949, and subsequently allocated the serial numbers 50-1269 and -1270 for these machines. At the time of its inception the H-16 was the largest helicopter in the world, having a fuselage almost as capacious as that of the contemporary Douglas DC-6/C-54. Though originally intended for the SAR role the Transporter, as the H-16 was ultimately named, evolved during the design process into a heavy-lift craft equipped with a tail loading ramp and optimized for troop and cargo transport. In this role the aircraft could carry up to forty troops or three light trucks within its fuselage, the interior of which was kept clear of obstructions by mounting the engines and all dynamic components in the upper fuselage. The H-16 was also capable of transporting large exterior cargo pods, and was equipped with variable-height landing gear legs in order to accommodate pods of varying sizes. The first Transporter (serial 50-1269) was powered by two 1650hp Pratt & Whitney piston engines and made its first flight in October 1953 with the designation YH-16. During construction the second prototype (50-1270) was modified to Model PV-45 standard through the replacement of its piston engines with two 1800shp Allison turboshafts. The change in powerplants and inclusion of various structural modifications prompted a redesignation to XH-27 in October 1952, though this was changed to YH-16A prior to the aircraft's first flight in 1955. Both H-16 variants were at times fitted with varying types of experimental horizontal tail surfaces, one of which incorporated large end-plate rudders, but none of these designs were adopted for permanent use. 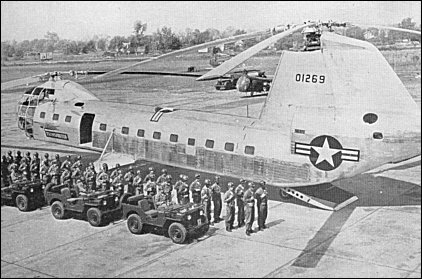 The Air Force ultimately decided against procuring the H-16 for operational use, and in 1955 the YH-16 was turned over to the Army for evaluation. The Army found the piston-driven Transporter to be underpowered and therefore awarded the reorganized Vertol company a contract for the machine's conversion to turbine power. The aircraft was duly equipped with two 2100shp Allison turboshafts, modified to carry up to fifty troops, and redesignated YH-16B. Despite these improvements the type was ultimately judged to be unsuited to sustained operations under field conditions, and the Army terminated the H-16 test programme in mid-1956. The second prototype�as the H-I6A�in flight. No tail surfaces are fitted and an engine exhaust is visible under the forward fuselage. Note the widely spaced main landing gear and flat fuselage floor for handling jeep-type vehicles loaded through the rear ramp. I need to make a correction to the info on the H16A service ceiling. I don't know where the 12,000ft. came from, it was 24,500ft. I was working for the U.S. Army in the Engineering & Development Branch when the new Col. thought we should fly the YH16. We flew it the morning of 5 Jan.1956 with the crew Harold and Don on board. After that flight we had lunch. The Army group departed in the Army aircraft. The flight crew resumed their work, taking off at maximum gross weight to establish the service ceiling. It was established over 12,000 feet. The helicopter crashed on the return flight. We were unaware of the crash until the following morning. I returned to the factory as the Army rep. on the accident board. During that week I also attended both funerals. I have in my files some pictures and the accident report. I will be 93 years old this week so in the event someone want's to contact me don't wait too long. The crash site stated is not correct. It crashed between Swedesboro and Clarksboro nj about 4 miles from the Delaware river. I saw the smoke from the crash and asked what it was and was told it was the big helicopter that we saw often before. I was then 15 years old. New email address,and Hello to Tommy Callahan who I used to know as a kid, until our dads were killed in the accident. My Dad is Harold William Peterson Jr., older brother Gary and younger brother H.W.P. III - born days after the accident. Thank you to Thomas George Callahan for correcting the spelling of the name and the date of the crash. I am truly sorry for your loss. I am the only child of George Callahan, who was killed along with Harold Peterson in the YH-16A. My father's name is Callahan - not Callaghan as is written above. Also, the day of the crash was Jan. 5, 1956 - not December 1955 as is written above. I remember the day very well. I was three weeks away from turning eight years old. My father was a wonderful loving man - losing him forever changed my life. Thanks for posting this info. I never had the opportunity to meet Uncle Bill (Harold Peterson) but have tried to find information about him the H-16. My uncle (Bill) Harold Peterson was one of the test pilots of the H-16.I also have the same Revell model kit still in the box.Also Gary Peterson is my cousin. Thanks for rememberng my Dad. I've got H-16 photos. I started working at Piasecki in Morton, PA, in June, 1952, just after graduating high school. I knew the two teast pilots that were killed in the "low gear" version. The tall gear H-16 version sat in the Morton flight test hangar until it was scrapped. I worked on the plywood mock ups of the CH-46, Sea knight and the CH-47, Chinook which side by side in the same hangar. The H-16 was brought down by test equipment failure..
Having worked my way up in the company by initially sweeping floors and ending in the publications department, the seventeen years I spent with the company taught me a lot. And where are they now (besides the one that crashed)? Is there any Aviation Museum that has one on display.